A few weeks ago I got an email from a staff member of WhedonCon, a charitable fan convention that celebrates all things Joss Whedon. 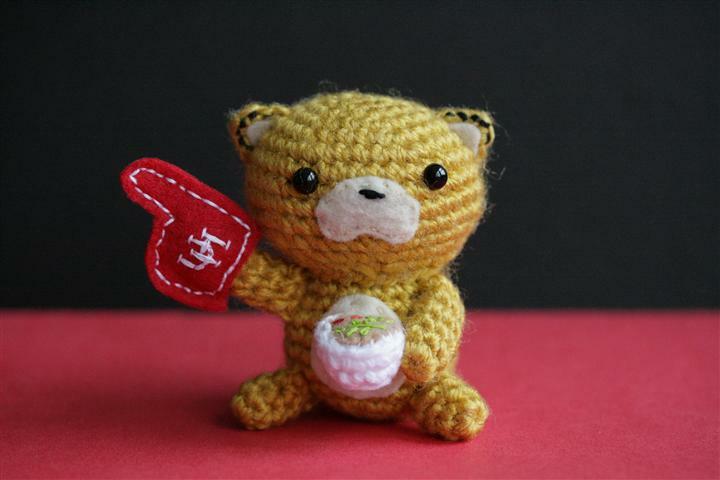 She told me that she organizes an event called WhedonKnit Nights, where people come together to knit and crochet things to donate items for Newborns in Need, and was wondering if I could donate a pattern of my own design for the cause. She said that the charity was in need of baby hats, blankets, booties, and sweaters. 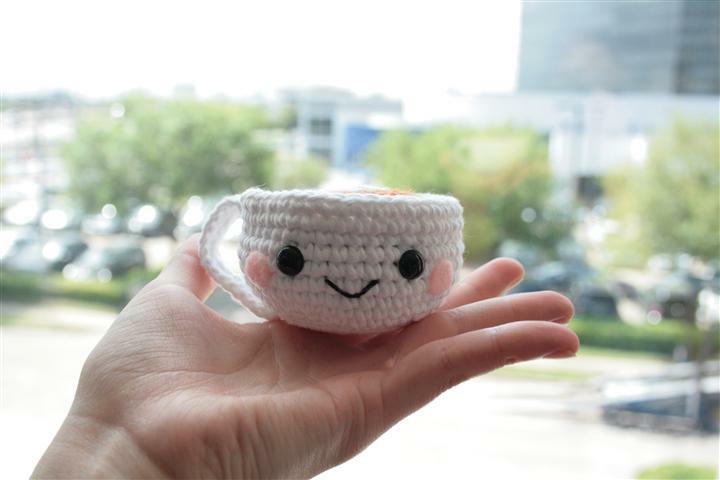 I’ve been crocheting for 6 years. I’ve never made anything wearable or remotely useful in that time. Try something new? Make something geeky? And for a good cause? I’ll bite! I asked her how “Whedon-strict” the items needed to be. Would Avengers be kosher? Or are we looking more along the lines of Firefly? She told me anything that was related to Joss Whedon or made a reference towards his work was fine. WELL THEN. That opened up LOTS of options. This was going to be fun. 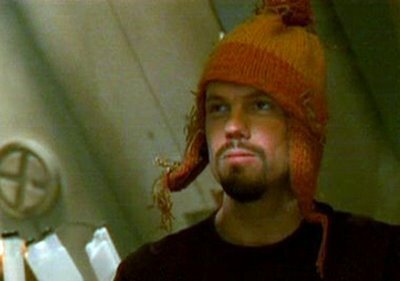 Baby Jayne Cobb hats seem to be an obvious choice, but there are already plenty of free patterns out there for those, so I wanted to try something different. Captain America immediately came to mind. A little Captain America baby beanie with a little shield blankie sounded perfect to me. Here’s the thing. Everything I’ve made for the past 6 years has been in the 3″ range. The hat wasn’t too much of an issue. Since it was all done in one color, I was able to keep adding rows until it got to a good size. The blanket is where things went wrong. I wish I had a better picture to show just how stupidly small the “blanket” initially turned out. It ended up being 9.5″ across, and that’s AFTER I stretched it out a bit. It was barely bigger than a personal pan pizza. This was a blanket meant for preemies, and it wasn’t even big enough to be a napkin. I had to take it apart down to the blue center and work it up all over again. Surprise! Babies (even premature babies) are juuuuuust a little bigger than the 3″-sized items I’m used to making. Just a little. I worked it up over again, and finally! Much better! Managed to add a good extra 5 inches or so to the diameter. It’s not exactly made out of vibranium so it doesn’t hold up too well on your forearm, but I think it’ll do well enough to keep a baby safe and warm. And of course you’ll need a little helmet to go with that shield. Safety first, folks. Hopefully everything will be fit to keep the littlest heroes warm. Patterns for the baby beanie and shield blanket are up for FREE can be found here. Tag me in any photos you post of your work, I’d love to see how it all turns out! Share your work if you make anything from the patterns, and share the patterns too! Happy hooking! Credit is given where credit is due, the pattern for the star in the center of the shield can be found here, written by Jodie over at her Jelly Wares blog. 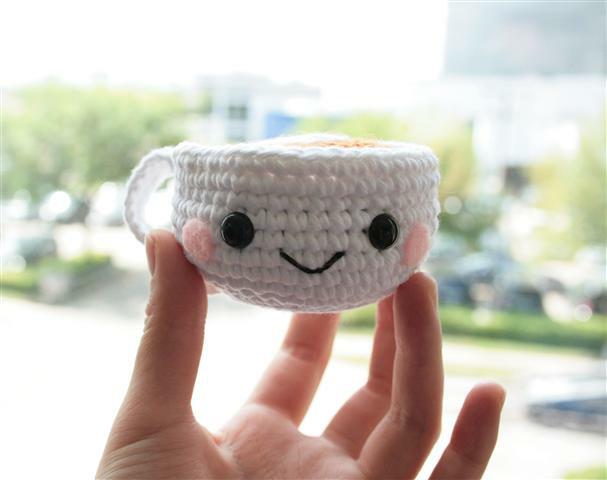 To find more patterns for items that can be donated to Newborns in Need, look here. For more information about donating to Newborns in Need, see here. I dropped by campus to deliver the lil’ guy and to grab a bite. I ordered a Western Indian bowl (marinated chicken, spinach, corn, all over a lovely bed of seasoned rice), topped with a poached duck egg. Let me repeat that. POACHED. DUCK. EGG. With the rice soaking up all that eggy goodness (I’ve got an unhealthy obsession with poached eggs), this was a bowl full of win. If any of you are fortunate enough to be on UH campus, these guys serve up some serious goodness. They’re super affordable, and they dole out hefty portions to boot. You eat well, spend less, and you get to support local farmers and growers in the process. TRIPLE WIN. Next time you drop by, say hi to the friendly staff, and say hello to their new pet! Lil’ coog, happily perched in his new home. Confession: I’m probably one of the least “green” eaters you’ll find. Maybe it’s because I don’t have enough cooking prowess to justify paying premium for organic/local food if I’m going to screw it up, and maybe it’s in the interest of saving a few bucks here and there. Even after watching Food, Inc. (great documentary about the food industry), I still ate mass-produced meats, thinking to myself “I don’t wanna know what happened to this chicken, but I haven’t grown a third arm yet, so I’m gonna eat it anyway,” as I chomped down on that chicken wing. But places like Revival Market are slowly turning me into a believer in the locavore movement. It’s a market. But they also serve food. And holy crap, the FOOD. Revival Market has a simple, straightforward mission: Local means fresher & cleaner, and fresher & cleaner means tastier, healthier, and better for the community. 🙂 The whole menu has wonderful items that are all made fresh, local, and just plain GOOD. But if you want the best example of everything Revival Market stands for, just utter three letters: BLT. Bacon, lettuce, tomato, and dammit, I’m convinced there’s some magic in there. It’s so simple…how could you POSSIBLY make it that much better? Much less $9-better? I had a bit of a Pulp Fiction moment when I saw the $9 on the board…just as Vincent Vega questioned the $5 milkshake, I questioned the nearly-$10 BLT plate. And oh, how Revival proved me wrong. Half of my BLT, shortly before I devoured it. That bacon is UH-MAZING. Bacon is already a sacred perfect form to me already, even the cheap-o diner bacon you’d get with a greasy breakfast platter. But THIS. This was something different. Fatty, perfectly crisp edges, smokey and flavorful…this is the remarkable result when your bacon comes straight from a farm and is cured and smoked in-house. Pair it together with fresh slices of tomato, leafy arugula, and a wonderfully light herbed mayonnaise, and you’ve got yourself a BLT that changes everything you knew about the classic sandwich. Those sandwiches that I once loved with the wilted lettuce, chewy bacon, and mushy tomatoes were suddenly shoved into a corner of my mind along with a few ex-boyfriends. One way or another, it’s a beautifully simple demonstration of Revival Market’s mission…when I thought a BLT was a BLT everywhere I go, Revival Market shows how just 3 locally sourced ingredients sandwiched between two slices of fresh-baked bread can elevate the taste and quality to a whole new level. No heavy sauces to mask the inherent flavors, no gimmicky garnishes to make it look prettier. Just pure, fresh ingredients left alone to allow the flavors to speak for themselves, all put together with care. And this is just ONE item on the menu that I’m gushing about here. These guys have fed me ridiculously well and have helped me slowly turn towards the fresher side of things, so I decided I wanted to give back. Their logo is a piggie with a chicken perched on top. 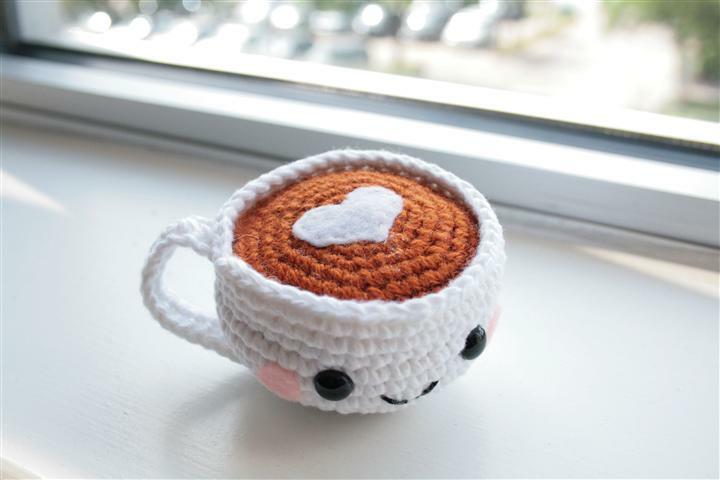 Showin’ some crochet love: Coffee edition! I’m a hopeless caffeine junkie. Not in the sense that I chug 5 cups of coffee a day or anything, but more in the sense that I’ve been on a one-cup-a-day habit for so long now that I get throbbing headaches if I go just one day without a caffeine fix. 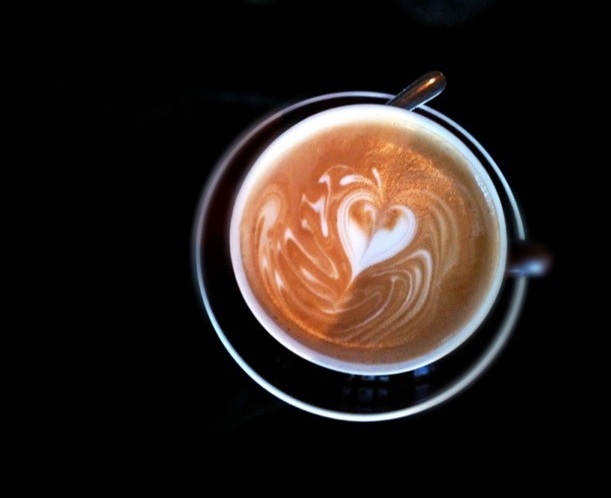 Houston has plenty of good coffee shops in the sense that they’re great places to socialize, lounge around, or get some work done over a nice hot beverage. On the other hand, not many of them actually have good coffee. I’m not saying that the other places have bad coffee by any means, but they’re not going to be the places that you’d visit if you want fresh and local roasted coffee for its own unique and inherent taste. That’s where Catalina Coffee comes in. 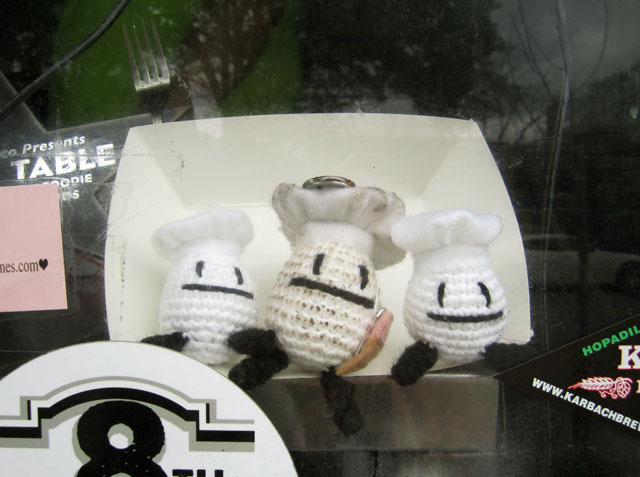 Back in October, I crocheted a little mascot for them based on their logo, and it looks like their lil’ dude wanted some friends. So I was more than happy to get my hook on and grant him that wish. 🙂 A couple of weeks later, he had two new buddies to hang out with. 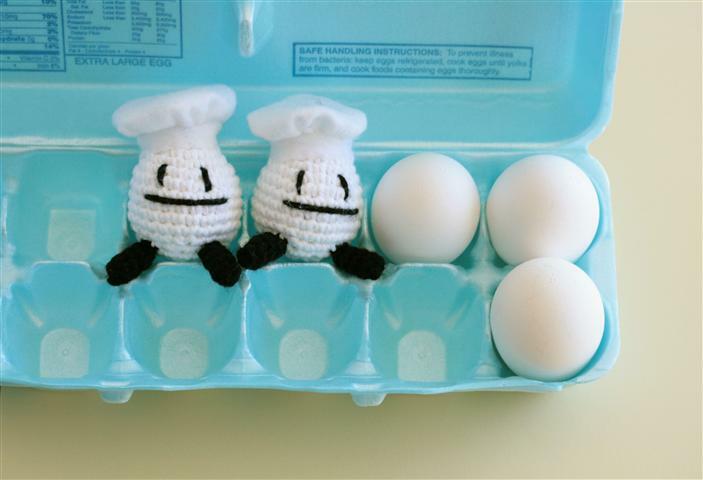 Two lil’ eboys, hanging out in my egg crate. 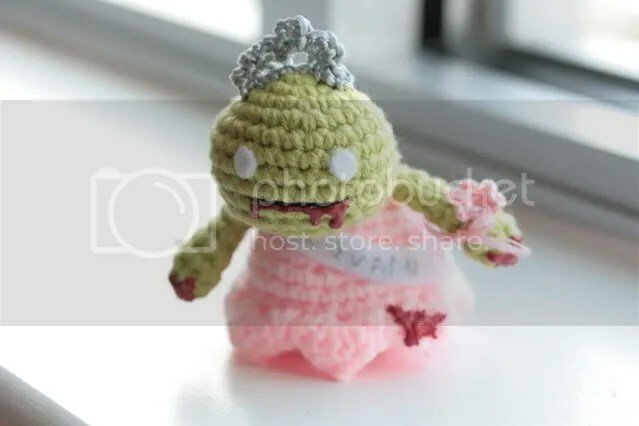 At least the prom queen was crowned BEFORE she ate her date. Here in my hometown of Houston, food trucks (aside from the multitudes of taco trucks) are a relatively new phenomenon (yeah yeah, I know all you NY and LA people are snickering away). Regardless, one way or another I’m pretty damn happy that they’ve caught on, and I’ve already found quite a few gems around town that fill me (literally) with deliciousness and happiness. 🙂 Cue Eatsie Boys, by far one of my favorite trucks so far. The food’s fresh, local, and freakin’ delicious. They started off serving some AWESOME savory dishes (my fave was the “pork snuggies”: slow-cooked Harrison Hog Farms pork belly, homemade pickles, green onions, homemade hoisin on steamed, pillowy buns = NOM NOM NOM)…then when the Texas heat got to be too much, they moved on to serving ice cream, which was just as awesome (“Makers Mark Some Noise + Golden Grahams”: vanilla spiked with Maker’s Mark, studded with Golden Grahams, and MOAR NOM NOM NOM). After stalking this truck for several months and trying just about everything on the menu, something had to be done. I decided to bring their mascot to life. 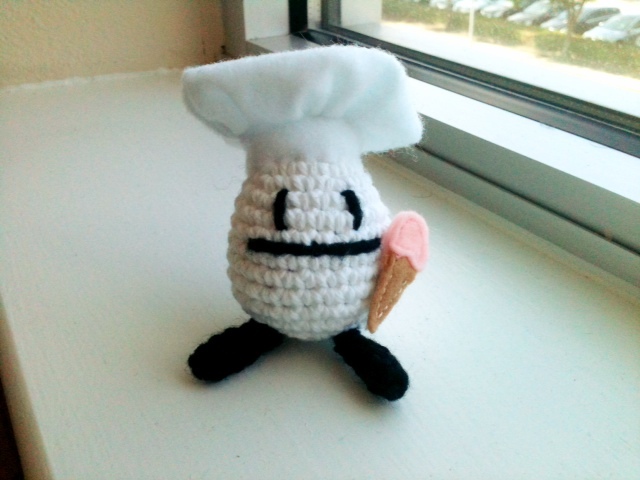 I crocheted a little eggman, complete with removable ice cream cone (gotta keep him seasonal if they bring back the pork snuggies, right? ), and set out to give the dudes at Eatsie Boys this lil’ token of appreciation. Because dammit, they’ve fed me enough awesomeness that they deserve some thanks. 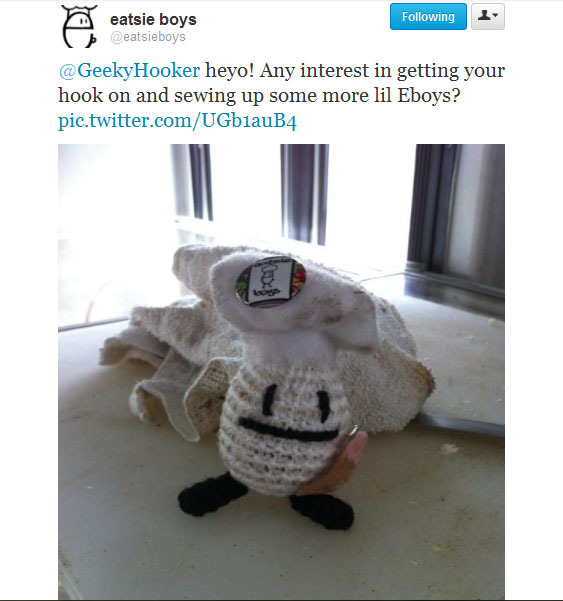 I sent them a tweet with a photo of the lil’ guy, and a few hours later I was at their truck window with the little eggman in hand. When I brought him out, the guy at the window immediately exclaimed “Oh my god, that’s YOU! !” Woohoo! My little eggman was finally home! We exchanged high fives, had a good chat, and of course I enjoyed some ice cream while I was at it (this time around I got “Slow and Low Sweet Potato Marshmallow”…and it is every bit as delicious as it sounds). 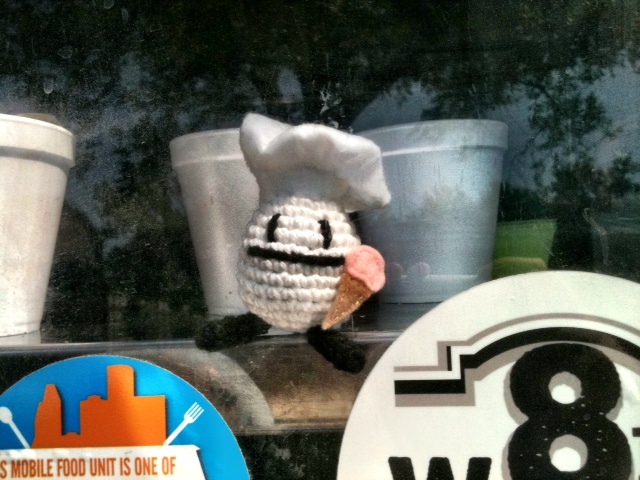 I got to satisfy my sweet tooth, showed some appreciation to one of my favorite local businesses, and now my little eggman was where he belonged: happily perched in the window of the Eatsie Boys truck. Last time I visited the truck, the lil’ dude wasn’t at his post in the window, but the guy informed me that he’s actually been hanging out in their tip jar, workin’ it for tips. Not only does the little guy have a home, but he’s got a job too! *Sniff*…I’m so proud. In all seriousness though, if any of you are in the Houston area, definitely check these guys out. They’re a fun bunch of hard-working dudes (I’ve joked that the owner is like the Ryan Seacrest of the Houston food scene), and their food is well worth tracking down the truck for. Eat, drink, and be merry, my friends! Eatsie Boys info: find them on facebook, twitter, or at their webpage. I have a book! 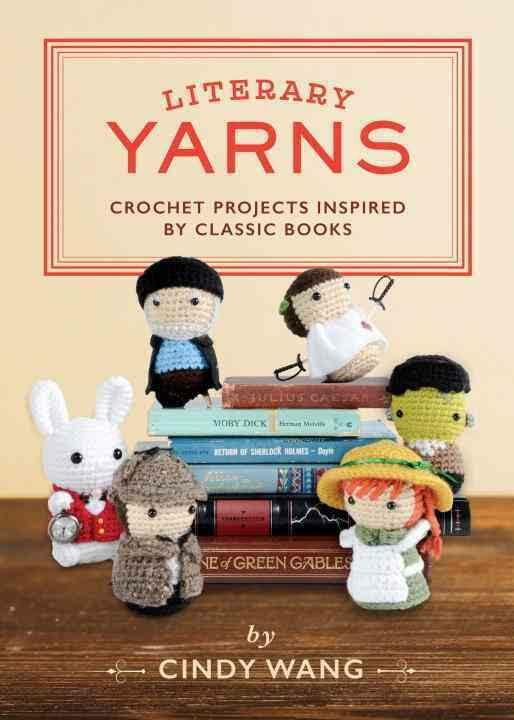 It’s called Literary Yarns and you can make some fun stuff from classic literature from it! Amazon.com – if you buy through Amazon don’t forget to do so through AmazonSmile to donate to charity! If you’ll be in Iceland 4/24-5/4, keep an eye out for these little guys! Find one and it’s yours to keep! Details in the blog post linked in my profile! I'm not just bringing porgs to Iceland! I'll be toting a little mushroom too. 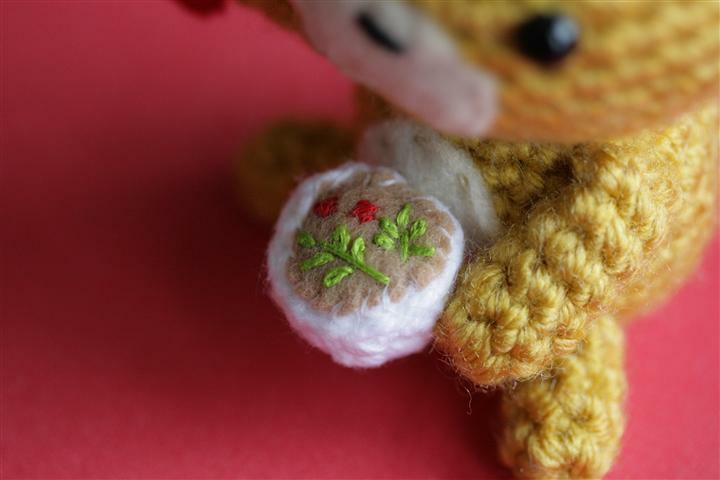 AAAAAAND I dropped a free pattern for it on Ravelry. GO FORTH AND MAKE ALL THE MUSHROOMS!! Porgs. Freaking porgs. Fun fact: porgs exist because the creators of The Last Jedi couldn’t get rid of the puffins during filming, so they just CGI’ed them into a whole new species. I’m heading off to #Iceland next week and since Iceland has lots of puffins, I felt that it was appropriate that I bring some porgs with me! Blog post to come with details on how to snag a critter if you’ll be in Iceland next week! He might be in a big beefy dude’s body, but at the end of the day Billy Batson is still just a kid. Check out the link in my profile for my thoughts on Shazam! Find little Billy at SDCC and he’s yours to keep! SHAZAM! I’ve got a new critter ready for SDCC! I saw Shazam last week and I was pleasantly surprised by how much I liked it! My thoughts on the movie and details on how to snag this little stinker in the link in my profile!